If you’ve opened a news feed or trade publication recently, you’ve heard about all the latest and greatest techniques you must use to further develop, engage and keep your vital talent. Making sense of all the options can be tiring and typically contradictory. Should you shift money away from merit pools and into more immediate feedback methods? Do you even need a merit pool anymore? Which rewards do your employees truly want? What should you do when the organization ditches performance ratings? Does your organizational culture support a spot bonus program? None of these questions have simple answers, and they are further complicated when you realize you must accommodate five generations of workers. Making sense of paying for performance in our modern world is a challenge. And cash is rarely the best answer to any of your rewards questions. 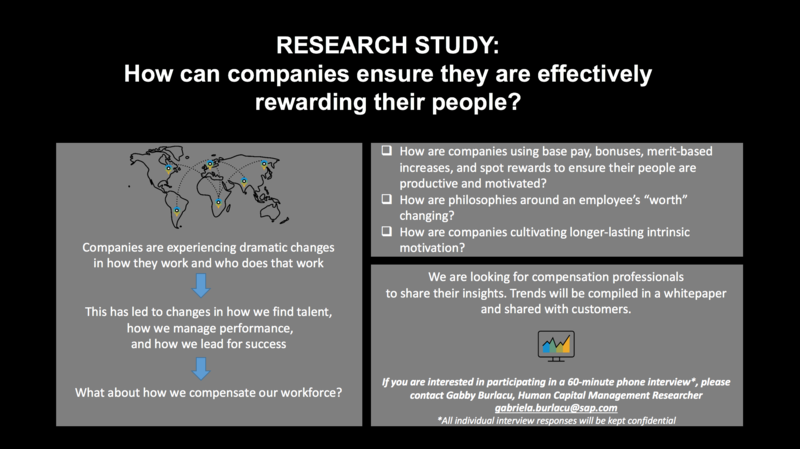 We are looking for current SAP SuccessFactors Compensation customers to participate in a research study exploring the leading practices companies are using to effectively reward their employees. Research findings will be compiled and shared with the ultimate goal of enabling customers to learn from one another – what are other organizations doing, what has worked well, what to watch out for, best practices, etc. Call to action – If you are interested in participating in a 60-minute phone interview, please contact Gabby Burlacu (gabriela.burlacu@sap.com ). We appreciate your time and look forward to hearing from you! Want to learn more about Compensation trends? Join SAP SuccessFactors on Wednesday, October 18, for a special webinar where you will hear some great advice and leading practices on navigating the confusing world of rewarding employees. Joshua Hill, Solution Adoption Advisor – Global Pay for Performance with SAP SuccessFactors, will share insights, research and customer best practices on how to find the perfect balance of rewards for your organization in today’s world.